In the weeks up to Christmas you will start to see a rather strange looking fruit appearing on the soft fruit displays in your local supermarket. Looking like a cross between a tomato and a dwarf mango, persimmons are the edible fruit of a number of species of trees in the genus Diospyros. Yes it looks like a Sharon fruit, but that is because Sharon fruit is a form of persimmon which received its pseudonym from the Sharon plain in Israel where it was extensively grown. Of course, confusion surrounding the persimmon doesn't stop there as there are two varieties commonly available and you need to know which one is which in order to avoid making a rather unsavoury mistake! The two varieties of persimmon commonly available are the round 'Fuyu' and the heart-shaped Hachiya. One way to consume very ripe persimmons, which can have the texture of pudding, is to remove the top leaf with a paring knife and scoop out the flesh with a spoon. Ripe persimmons can also be eaten by removing the top leaf, breaking the fruit in half and eating from the inside out. 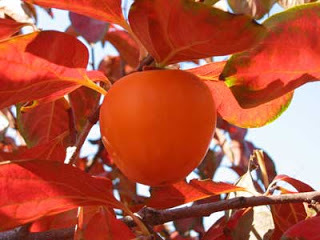 Hachiya persimmons are heart-shaped and have a shiny deep orange skin that may be streaked with black. Hachiyas can be eaten only when fully ripe. 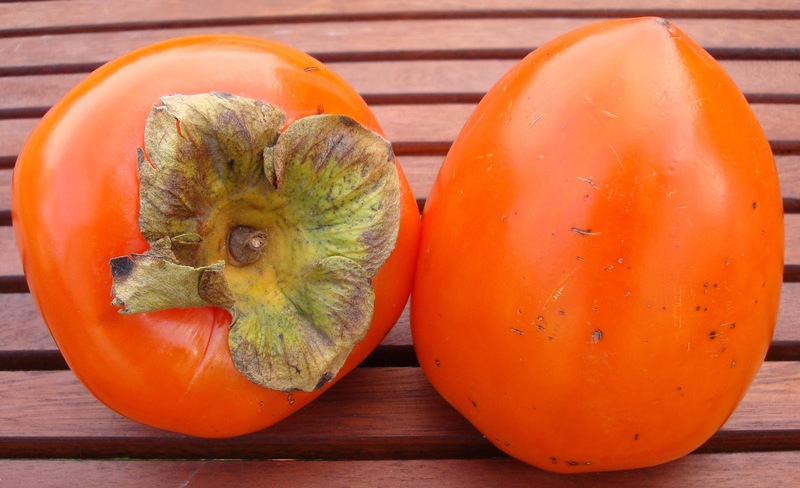 How can you tell when a Hachiya persimmon is ripe? Hold it in your hand. It should feel like it's filled with water and will be extremely soft and squishy. Removing the thin skin reveals coral coloured flesh so thick and glossy it looks like jelly and will taste a bit like it too. It will taste like a very sweet blend of mango and apricot. Eat them plain or use them in baked goods, sauces, and smoothies. Just remember this: DO NOT eat an unripe Hachiya as the flesh will be full of bitter tasting tannins. It can take up to a week to ripen, but you can speed things up but placing the fruit with a banana inside of a paper bag. The banana releases ethylene - a natural plant growth regulator, which speeds up the ripening process. You can tell when Hachiya persimmons are ripe as they will turn red and display long cracks in their skin. 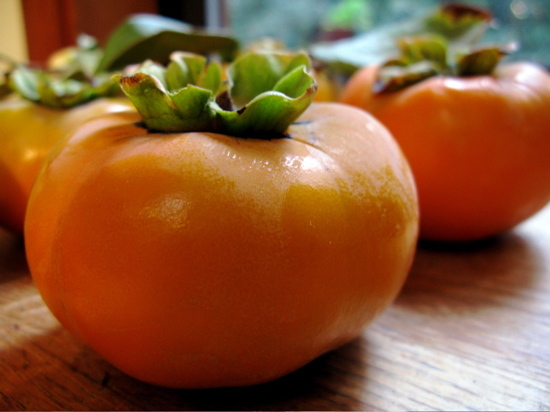 In contrast, Fuyu persimmons are squat and rather heavy for their size. 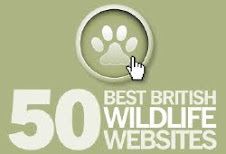 Their skin ranges from pale yellow-orange to brilliant reddish-orange. Generally, the darker the colour the sweeter the taste. 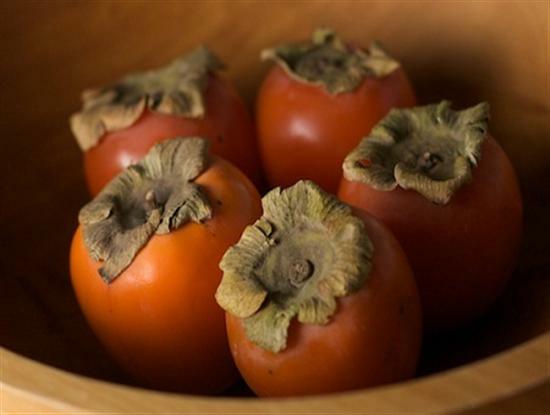 Unlike the Hachiya persimmon, Fuyu persimmons can be eaten firm or soft. Firm Fuyus can be eaten like an apple, skin and all. And when you slice off the top, a beautiful star will appear in the flesh. Crunchy cinnamon flavoured Fuyus are also great in salads and salsas.